We've been working with former Ski Olympian Martin Bell for over 15 years and he created our unique PB Martin Bell Ski Academy, which runs every year in Zermatt and, from this winter, in Arosa too for children, aged 11 to 15. In this series of blog posts, Martin shares his extensive knowledge and valuable expertise. This is the sixth post of the series, in which Martin shares his expert insight on ski racing. The first downhill ski races, over 100 years ago, just had a starting gate and a finish line. Skiers had to navigate their own way down the mountain, through the forests and farmlands, to the village. Fairly soon, however, "control gates" were introduced; these were pairs of wooden poles which the racers had to pass through on their way down the course. Failure to do so ("missing a gate") led to disqualification. Eventually, "alpine" skiing (so called to distinguish it from the "nordic" events of ski-jumping and cross-country) evolved into the four types of race that we have today. These four disciplines are, in ascending order of speed: slalom, giant slalom, super giant slalom, and downhill. With the shortest, quickest turns, slalom requires precision, speed of movement and agility. At the top level, racers are turning more than once per second. A typical slalom course might contain 60 turns, lasting between 45 and 55 seconds. Two runs are held, on different courses, and the result is decided by the total time over the two runs The racers make turns around plastic poles which have spring-loaded hinges at ground level, allowing them to bend down easily when hit. This enables the racers to ski "through" the gates; most of their body passes inside the line of the gate, with only their feet going around the base of the gate. In fact, according to the rules, only the ski tips and the feet have to pass around the gate.Slalom makes for a great spectator sport because, in contrast to the faster events, the whole race course is often visible from the finish area. Increasingly, World Cup slaloms are being held in the evening under floodlights, to enhance the atmosphere. It is often said that Giant Slalom, or “GS”, is the easiest discipline to do, but the hardest to do well. The medium-sized turns are the most similar to the typical turns made by recreational skiers on the piste. The most important element of GS is to carve clean turns - using the shape of your skis to glide around the turns on your edges, with the ski slicing forwards through the snow - not pivoting or scraping sideways across the snow. GS speeds are higher than for slalom, up around 40-50mph. Each run may last between 50 and 80 seconds. Unlike in slalom, where the racers turn around single plastic poles, the racers have to turn around a cloth "panel", which is stretched between two poles. (These panels are also used in super G and downhill.) 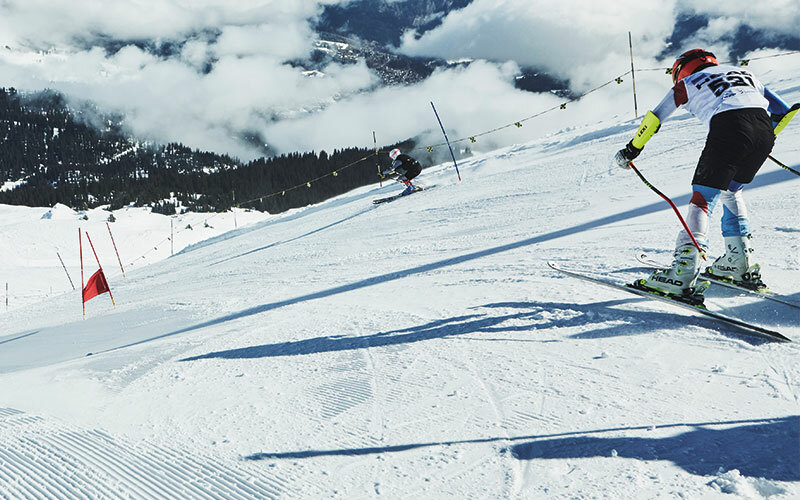 As in slalom, the winner is determined by adding together the times from two runs on different courses.GS is usually where non-racers first learn about ski-racing, in a ski school race or a resort's pay-to-race course. They soon realise that here is a massive difference between choosing where you turn, and having your turns dictated to you by a race course. The most difficult part to get right is the "line" - this requires that you get most of your turn done above the gate, so that, as you go around it, you are already pointing across the hill, towards the next gate. If you don't do this, you risk getting "late" or "low" with your line, struggling harder and harder to finish your turns beneath the gate in order to make it to the next gate. If you do get late, and you don't rectify it immediately, you risk missing a gate and being disqualified. The most recently invented discipline, Super Giant Slalom, or “Super G”, was introduced in 1982, as a compromise event midway between GS and downhill. Throughout the 1980s, I personally witnessed the evolution of Super G on the World Cup tour. At first, there were huge discrepancies in the course-setting. Some Super Gs were just like a widely-spaced GS. Others were like a downhill course but with a few extra turns. Eventually, super G settled down into a bona fide event, with its own challenges. The main issue is that the speeds are high (50-65mph), but there are no prior training runs on the course, unlike in downhill. So the course inspection before the race is crucial, especially over the blind rollers. In Super G we always see a high rate of "DNFs" ("did not finish").If you make a mistake in a run of Super G, there is no chance to make amends - this is a one-run event. A super G run typically lasts between 70 and 100 seconds. Downhill is a bit different; it is the only event to have all red gates (the others alternate between red and blue) and it is the only event where there are official training runs on the course (between one and three of them) before the race in order to improve safety. Downhill is glamorous because of the danger. There have been fatalities and the speeds are high - typically between 70 and 90 mph, although racers have even been clocked going over 100mph in a World Cup downhill. Another risky element is the jumps. Super G races occasionally have small lips, where the racers take air, but downhills have massive jumps, where the racers might fly as far as 40 or 50 metres at World Cup level. That is half the length of a football pitch. The ideal technique is to absorb or "press" the lip of the jump, in order to fly as small a distance as possible. This is actually faster, as you can get back on the ground sooner, and start accelerating again. Because of the speed, aerodynamics are more important in downhill than in the other events. Racers have to crouch low in the "tuck" position, with their poles held tightly under their arms. Extra long skis have to be used, for stability - sometimes as long as 218cms. Downhill is not all high-speed straightlining though. There are turns, and these are often decisive. Racers might come into a particularly tight turn, carrying 80mph, and exit the turn with 60mph. The racer with the most technical skill, who can exit at 65mph, will probably win the race. A downhill race consists of one run, down a 2-mile course that usually lasts close to 2 minutes. For a World Cup event, the vertical drop from start to finish must measure at least 800 metres (2625 feet). In cases of severely difficult weather or snow conditions, a two-run downhill can be held over a shortened course. The beauty of ski-racing is its simplicity. There are no arguments, no judges' opinions - the only thing that matters is the number on the clock at the end of your run. It is also very measureable. When you start racing, you can measure your deficit behind the more experienced racers very precisely and track your improvement just as precisely.However, ski-racing is also a very harsh sport. If you have technical weaknesses or deficiencies in your skiing, these will usually be honestly reflected by the clock at the end of your run - there is no place to hide.But when you manage to pull off a perfect, cleanly-carved run, and achieve a good result, there is no better feeling. For more information on the PB Martin Bell Academy, click here or call 020 3651 1970.